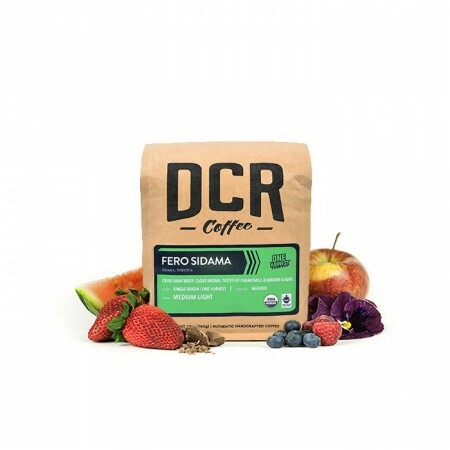 This is the Ethiopia Fero Sidama Fair Trade Organic brought to you by Dillanos Coffee Roasters. Grown by the Fero Growers Union in the Sidama region at 1,800 meters, this full natural coffee is a perfect example of why we love coffees from Ethiopia. The cup is a juicy fruit bomb with notes of blackberry and blueberry. Absolutely fantastic coffee, best I've had in quite a while. Nice body and strong blueberry notes. Made in a Chemex @ 1:15 ratio. I really like the flavor of this berries in this one. Could definitely taste the blueberry. That came through for sure. It was interesting and a nice change of pace. It was not your typical "fruity" notes but I'm not sure that it was really my thing. Light-bodied but strong. A bit of astringency, not especially smooth. Michael's favorite, he loves it - order again! I am a fan of African coffees, but this one was odorless and tasteless to me. YMMV, but I was not very happy with it in my Saeco automatic. This was great! Really appreciated the berry flavors and fruitiness. It was medium to light and really enjoyed it. Has a pleasant aroma of muddled clove and brown sugar. There is a mild sweetness to it with a hint of berries. Very mild in my opinion. I'm not able to pull any citrus/sour/acidic aftertaste to it which is disappointing as I prefer that to balance the sweetness with. Almost no bitterness at the end either. Overall a decent brew, but would like it to be a bit more acidic. Drank it hot/black as a V60 pourover. Flavor was a little bit too strong, but overall good taste and feel. This roast is too light for my tastes. I think the coffee is fine, but my husband does not like the berry taste. This was excellent. I normally am not a fan of African coffees and never drink it black and yet this one was easy for me to drink black. Very good and juicy but not strong on the berry flavors for me. Loved the hints of blueberry; definitely a lot more noticeable than I originally though it would be. The cold brew of these beans almost tastes like bad alcohol. The tastes are strong, but I hate them all. Crazy fruity and fragrant. An awesome Ethiopian. Felt like I had to wait several days for this coffee to taste like it is supposed to, Not sure how I feel about natural wash either, Im still pretty new to coffee and found the flavor a bit abnormal. I would be up to try another one after a few months. I’m sure this is a good coffee but I don’t find the blueberry taste pleasant at all. Really enjoyed the fruity notes. This is a delicious coffee! The prominent berry flavors make each cup a mixed berry pie -- a slice of summer in February. Definitely one of my favorites so far. Really enjoyed the fruit notes on this one. I found my first brew a tad sour, but next I brewed at 195 F and the sour disappeared. I tasted mostly blackberry and enjoyed its fuller mouth feel. Really good cup of coffee. Blackberry and blueberry really shined through from the aroma to the flavor. Had a nice chocolate flavor that rounded it out really well. Was my girlfriends favorite coffee from mistobox so far. Really disliked this one. It smelled great but was much too fruity for my tastes. This was very berry as advertised with a great body too. I really like this cup, but would also like to try a few others with similar body, but less fruit forward. The cup finished very well! Everything I expect and hope for from an Ethiopian bean. Incredibly juicy big blueberry and blackberry flavors. Slightly acidic. Insane berry notes! Cold brewed, the nose is even stronger. This coffee was great. I didn't give it 5 stars as I'm reserving that for what would be my "Top 5 best coffees". I liked the fruity taste to it, but for my next coffee, and I'm looking for an earthy, bold flavor. Looking forward to hearing your recommendations! I liked the sweet blow followed by a full body aftertaste. I find that I really love and look forward to the Ethiopian coffees like this, with their bold flavor and berry notes. I really enjoy this one, and could drink it daily! Definitely a 5-star for me. Amazing Beans! Love everything about it. I never thought I had a coffee that was too fruity.... Until this. I really like this coffee, it's smooth and for lack of a better phrase, bursting with blueberry flavor. I'd say it was more of a fun than everyday coffee, but again, very tasty! This has a darker burnt taste that is a turn off, although i've definitely had worst tasting coffees. This coffee has an aftertaste that I do not enjoy. Almost tanic in nature. Excellent flavor. My favorite coffee you guys have sent. No matter how we brewed it, it tasted kind of watery and lacked punch. AMAZING!! Best coffee I've received from mistobox so far! The fruitiness is very pronounced yet is still very balanced. Love this coffee. Rich yet smooth. I've brewed about five Ethiopian coffees in a row. All prior to this were good with fruit-forward flavors no matter the brew method or grind. This one tastes like aspirin and tin foil. I've never had an Ethiopian without the slightest hint of fruit in it. It's so non-fruity and bitter that I question if the bag contains the right coffee or if I got a defective roast or something. After several brew attempts, I figured out it's decent if I sift the grounds first and then do a full immersion brew. It's a huge hassle and still not the least bit fruity or sweet but at least I can finish the bag. I would drink this fruit loop-y coffee erry day. Coffe is not our style, what we've noticed is there is a particular note in some coffees that has a sour taste. I cannot pinpoint a common denominator but it was heavy in this particular roast. This was hands down the best cup of coffee to date with this subscription. There is so much blueberry and blackberry notes on both the aroma and taste its not even funny. I cannot express how much I enjoyed this coffee. Please send me more like this one! The fruit notes were very present, I liked that a lot. I don't think it's been my favorite, but if you want something that is very fruit-forward and almost tart, this is the one. Smells incredible. Great taste as well. Love the berry notes and smells. Less caffeine than I'm used to which is probably a good thing. Very very good coffee. This! This hit the target on the money. I'd be happy to drink this forever. It has the perfect note of fruitiness while throwing in a whole range of holiday spice flavors. It's so complex yet still smooth to the palate. Literally perfect. Way too fruity for me, also left a bad after taste. Not a fan. Excellent cup of coffee and a nice change of pace from my previous flavor profiles.